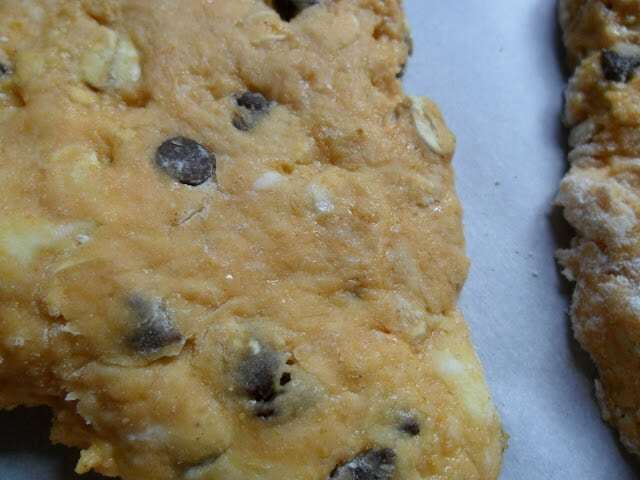 Pumpkin Spice Chocolate Chip Scones are the perfect blend of fall flavors. 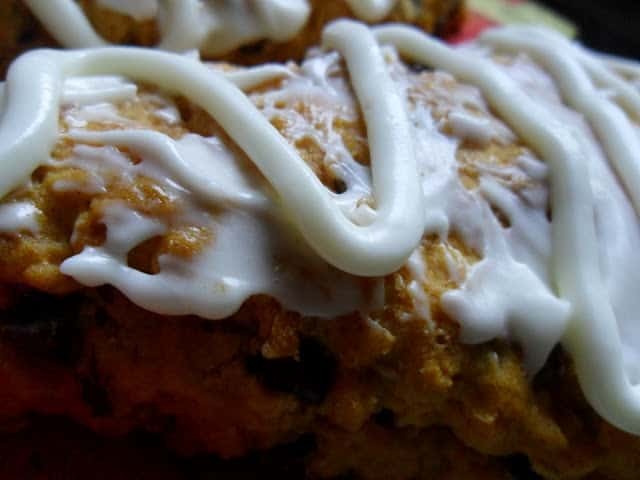 Canned pumpkin, pumpkin pie spice, apple juice and mini chocolate chips are all rolled into one delicious scone. What more could you ask for, right? Well, how does a cream cheese frosting sound! Heavenly, doesn’t it. Make these fall flavored scones for Thanksgiving brunch or before you head out the door to enjoy a fall day of apple picking. What do Pumpkin Scones Taste Like? 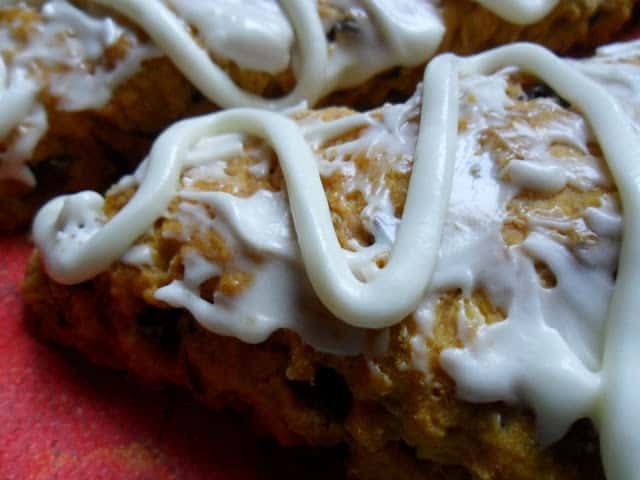 To me, pumpkin scones are a cross between a pumpkin cookie and a pumpkin bar. They are made with canned pumpkin and pumpkin pie spice which gives them that classic taste. The texture and density of the scones, reminds me of a cookie or a bar. Make them for yourself and see what you think! One thing is for certain, they are delicious but the cream cheese frosting takes them a step up from ordinary to spectacular. The perfect combination of fall flavors. Preheat oven to 425 degrees. Line baking sheet with parchment paper. In large bowl combine flour, oats, brown sugar, baking powder, baking soda, salt, and pumpkin pie spice. Cut in butter until mixture resembles coarse crumbs. In small bowl combine egg, apple juice, milk and pumpkin. Add milk mixture to flour mixture. Stir together. Fold in mini chocolate chips. Turn dough onto well floured surface. Knead 5 to 10 times. Pat dough onto a 10 inch circle. Cut dough into 10 wedges. Place wedges on prepared baking sheet. Bake scones for 12 to 15 minutes or until golden brown. Remove from baking sheet. Cool on wire rack. Here is another recipe using canned pumpkin. Black Bean Pumpkin Chili. Great post! I am a new fan and am going to spend some time browsing! I would love for you to come share at my From the Farm Blog Hop. We're trying to reach 300 linkups this week and we're almost there!